Lions and Tigers and Teeth, Oh My! This morning was the kindergarten "Winter Sharing Celebration". PC to a fare-thee-well, right? I say, let's call it Festivus Hanukwanzmas and be done with it. But I digress. 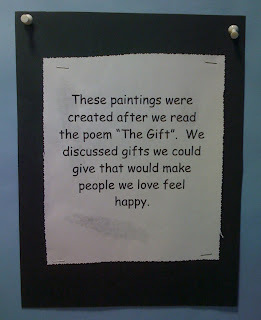 Up on the bulletin board in the classroom was each child's response to discussion of gifts that would "make people we love feel happy". Most of them were on the order of "a chapter book for my sister" or "a robot for my mother". My lion and tiger and leopard obsessed child? 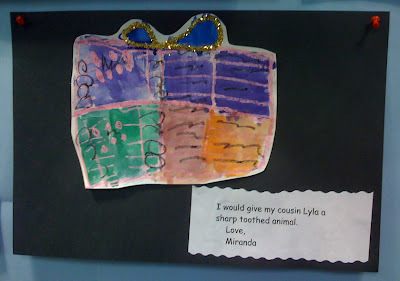 Would like to give a sharp toothed animal to her cousin. I love that Miranda. She's a girl after my own heart. My Violet wants to give Daddy a horsey and a Superman costume for Christmas, but I think a sharp toothed animal would be a much better choice! In a pretty package too! Anyone can give a book, but a sharp-toothed animal? That is thoughtful. Not a warm, soft and furry animal, oh no. A sharp-toothed animal. i wonder how you'd wrap that one! Oh my God, i just peed my pants! I showed that to Lila, who looked genuinely touched. She seems to think the sharp-toothed animal would be for her protection. This one goes in the *save* pile! Can I give a sharp-toothed animal to my motherinlaw for hanukah? huh. this gives me a glimmer of insight into my sharp-toothed animal obsessed youngun. Very excellent. I can probably lend her Coco, the imaginary lion. Thank you -- I needed a warm fuzzy this morning. Thank Mir for me, too. I think that Lyla is very lucky! LMAO! Nice - so her and Lyla get on then?!? We had our Nativity on Tuesday and Wednesday ... so glad that's over for another year! That is SO great. I wonder if you can get one of those at Target? Too bad she doesn't know my kids. They would love it. Fantastic! Now that's the kind of kid you want to be friends with. Think big, think fabulous! Your kid is = to my hero. I would like to give a sharp toothed animal to my mother in law. In her face. Launched from above. In a surprise attack. Just sayin. so funny. love the accompanying illustration! I think that might be the very best response she could have given. Hilarious!